President Poroshenko expects it to become a "triumph of Orthodoxy". On 19 April, parliament passed with 268 votes draft resolution No 8284 in support of the Ukrainian president's appeal to Patriarch Bartholomew I of Constantinople to grant autocephaly to the Orthodox Church in Ukraine. "As the head of the state of Ukraine, representing its citizens, including those who belong to the Ukrainian Orthodox community, who, thanks to the baptism by the Constantinople Mother Church 1,030 years ago, profess the Orthodox Christian faith - I ask you to provide Thomos about the autocephaly of the Orthodox Church in Ukraine. This long-awaited document will not only mark the triumph of Orthodoxy, but will also become an act of profound historical justice, because it is from Constantinople that the light of the Christian faith fell on our blessed land," President Petro Poroshenko said in his appeal. 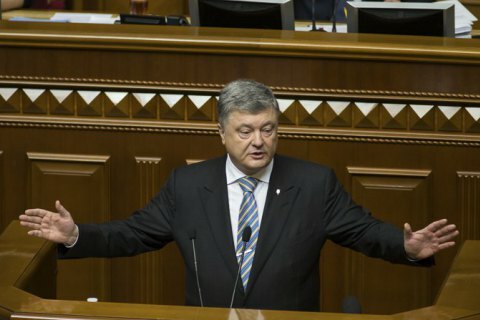 According to Poroshenko, only Bartholomew has a canonical right and legal authority to resolve such issues, and "our entire nation looks at him with reverence and hope". Having adopted the resolution, MPs supported this appeal. The explanatory note to the resolution says that on 16 June 2016, the Ukrainian parliament had already sent an appeal to Ecumenical Patriarch Bartholomew I with a request to grant autocephaly to the Ukrainian Orthodox Church. In particular, parliament asked Bartholomew to issue a Thomos (decree) on the autocephaly of the Orthodox Church in Ukraine. However, over the past two years, the desire to create a single local church in Ukraine has significantly increased. "The Moscow Patriarchate is increasingly being used as a tool of propaganda of the annexation of Crimea and support for Russia's armed intervention in the east of our country. In such circumstances, Ukrainian society demonstrates an even greater support for the unification of the Orthodox Church and recognition of its autocephaly," the document reads.